Now, there is no debating that two of the world’s biggest videogames have had an effect on Mega Coin Squad. With Big Pixel Studios and Adult Swim Games dropping their first Xbox One title onto the marketplace, you’ll find yourself whisked into a fast paced world full of stomping and coin collection. Have Mario and Sonic had much influence? I’ve been playing Mega Coin Squad for a while now and the very first thing anyone I speak to regarding the game mentions is that the premise is exactly that found in Mario. Now, I beg to differ, for Mega Coin Squad is a different game entirely. Okay, we may need to collect coins to our hearts content, but the platforming goodness found in Nintendo’s baby is completely absent from what we have here. But what we do have is a game that is so fast paced that it at times makes your eyes bleed. And your fingers. And anything else that may struggle to hold up under the stressful times it brings. Your heart perhaps. 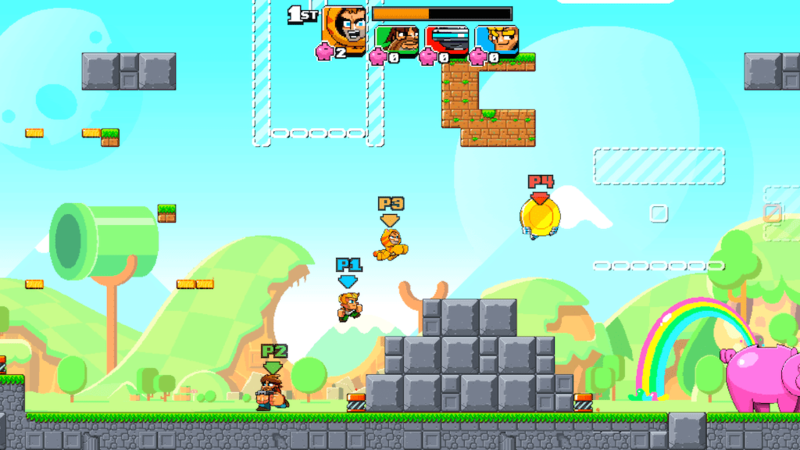 Set on Mega Coin Island, you’ll get to take each of the games five characters across the lost world as they battle their way through constantly evolving levels, fight off the most mutated of enemies and dodge dangerous traps. Well, in fact there are six characters but I’m not going to go spoiling the secret one here. 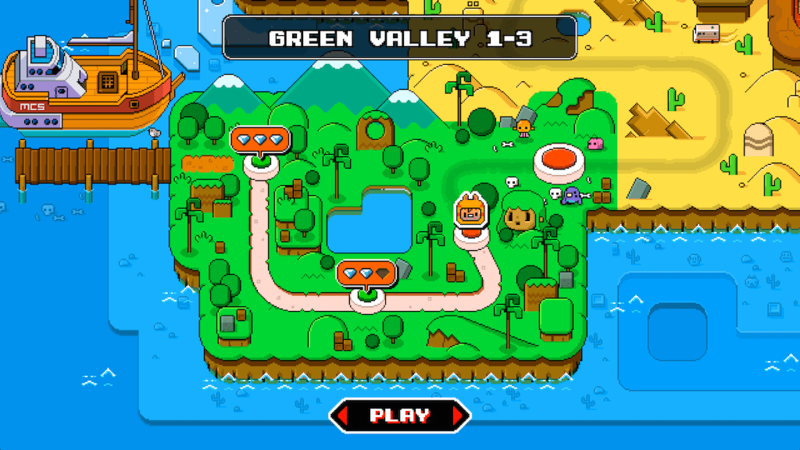 Mikey, Stef, Chunk, Mouth and Data will all require you to help them navigate through the Green Valley, across the Desert, through the slippery slopes of Snow City and finally into the heat of Lava Land, whilst they go about, dashing, smashing and collecting as many coins as possible. But collection isn’t the only name of the game as they’ll need to bank them as they go in the large Piggy Bank that is found on each stage. Stash the required number of coins and you’ll find your guys move safely onto the next chapter. But get hit by any of the traps or enemies that are in place to stop you, and you’ll find a huge chunk of your collected stash will be scattered around the world, lost from your pocket unless you can quickly gather it all up again…just like you have to when running around with that blue hedgehog then! Whilst the early levels only need you to pick up and bank a small number of coins, those found in the latter stages will ensure that you’ll be battling away for a good old while in order to catch the right number. At times, the fast gameplay and need to gather up just a couple more coins means that stress levels go through the roof, especially when you get close to completing one stage, only to see a stray missile rid you off your last health heart and final few coins. Manage to battle through and depending on how well you’ve done, you’ll be rewarded with a number of gems. These can be used to upgrade your character and unlock some tasty new power ups, but the gems are hard to come by and will need a good couple of playthroughs in order to nab them all. Whether you go all out and just try to complete all the stages of Mega Coin Squad, or decide to battle through in the quickest time possible, or manage to bank the required coins in one go is up to you, but if you really plan on getting your mitts on those power ups then you’re going to have to forget about the former idea real quick. Assault rifles, drill cannons and rocket launchers are all welcome additions and will help you fend of the various nasties well. The enemies themselves are rather hard to describe, but all you need to know is that there are most definitely a decent mix of the fast, the slow, the powerful and the nippy that are slowly drip-fed into the action. With multiple enemies on screen at any one time, you’ll need to master all your characters skills and powers if you are to succeed. With four different skill sets for each guy – speed, acceleration, weight and power, each time you decide to play with a different character, you’ll find the gameplay is just that little bit different. What you can find yourself smashing with ease with the powerful Chunk just won’t work the same with the delicate but super quick Stef. Four worlds with four stages in each may not sound like a lot, but factor in the numerous plays you’ll need in order to grab all the gems and then multiply that six times if you are to experience the action with all the characters and Mega Coin Squad will definitely keep you going for some time. And once you’re done with the single player campaigns, then a decent multiplayer offering is on hand to stretch the hours out even more. The skills you learn in the single player campaign come into play brilliantly here but unfortunately, Mega Coin Squad is bereft of online multiplayer (I’m not counting the now standard online leaderboards). This is a strange omission as the local battles and game modes that are present would have worked immensely well online. With the chance to take part in four completely different modes from a full on death match to needing to hold a rainbow for the longest time possible, then it would have been lovely to have been able to go up against friends via Xbox Live. As it is, if you can grab up to three local friends or family, then you’ll have a great time dishing out justice or collecting mega coins as you go! 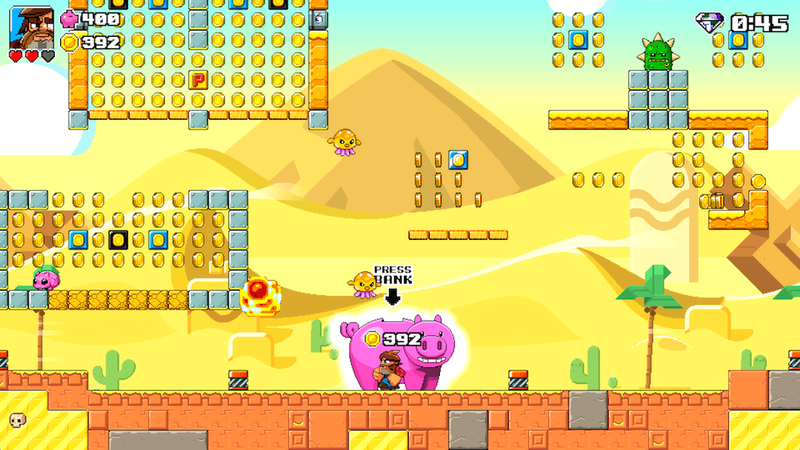 The online omission is perhaps the only thing that stops Mega Coin Squad from becoming an absolute must buy, because I’m otherwise struggling to find something I don’t like about what Big Pixel have done. The visuals are lovely and well realised, whilst even the backing tracks are pretty catchy if a little repetitive. The controls hold up immensely well and aside from the odd initial confusion of how to dash in various directions, quickly become second nature. Something which is needed amid the manic confusion that sometimes reigns. If you’re after a fast paced single player game with plenty of replayability and are happy enough for the old ticker to take a bit of stress, then look no further…the Mega Coin Squad are here and should certainly be checked out!